FICO: Created Industry marketing strategies and budgets for banking, Insurance, Healthcare and Retail solutions that shifted the company from product to solution focused marketing and sales. MarkMonitor: Developed Corporate, PR, AR and field marketing plans for enterprise brand protection company, driving revenues in new markets. Digex: Designed corporate, channel marketing, PR, AR and field marketing plans for web hosting firm, growing revenues from $64M to $240M in three years. GTE Internetworking: Product marketing plans for ecommerce, web hosting and knowledge management solutions that created visibility and sales in new areas for the firm. Genuity: Created product marketing plan for internet access, web hosting and VPN start-up. Goldmail: Developed Business Plan to address a new market segment. FICO: FICO Economic Impact Service, FICO Bankcard Growth Solution, FICO Insurance Claims Fraud Solution, FICO Model Central Solution, FICO Retail Dialog Manager and Medication Adherence Score. MarkMonitor: Brand Protection Solution, Anti-Phishing Solution and DNS Services. Digex: Managed Hosting services, Commerce Solutions, Managed Firewalls, Security Services, Load Balancing Solutions and Digital Certificates. GTE Internetworking: Commerce Reach and Knowledge Reach. Genuity: Internet Access Services, VPN Solution, Managed Firewalls, Web Hosting. FICO: Generated thousands of qualified leads per year, resulting in over $100M in sales pipeline. Created global, multi-touch campaigns for banking, insurance, healthcare and retail. 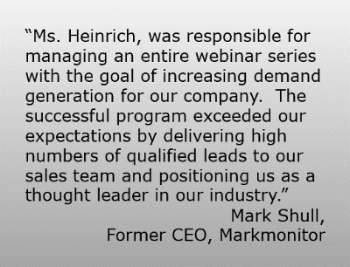 Markmonitor: Increased sales pipeline by 50%, year over year for brand and anti-phishing solutions. Digex: Developed lead generation campaigns targeting Fortune 500 accounts, resulting in the capture of over 35% of that audience. GTE Internetworking: Drove more than 2K qualified leads for new ecommerce and content management solutions in six months. FICO: Drove media and analyst strategies for industries: banking, insurance, healthcare and retail, resulting in 20% increase in trade media placements and 15% increase in analyst coverage from Gartner Research, Tower Group and Forrester Research. MarkMonitor: Achieved extensive analyst and press placement with the Gartner Group, WSJ, New York Times, Reuters, Associated Press and others. Launched YouTube client video program, highlighting FICO implementation successes, with participation from brands such as Capital One, Samsung, National Bank of Australia and others. Executed Linkedin lead generation campaigns, leveraging multi-touch program to targeted audience(s). Leveraged Twitter to increase company conversation around specific trade events. Developed industry relevant content to financial services and other blogs, garnering increase in membership and visibility. Identified and influenced social media associations, providing valued content and data. Executed, with outside agency, quantitative and qualitative study to assess market needs for SMB credit portfolio services. Study included conjoint analysis around many input factors and extensive, multi-city focus group component. Created competitive analysis in preparation for product market requirements and product launches that included addressable market assessment, competitive landscape, pricing structures/pressures, key differentiators, barriers to entry, media visibility, client adoption and client needs analysis. Examples include competitive analysis for healthcare insurance fraud solution, P&C insurance fraud solution, credit scoring offering, retail database marketing solution and others.